NEW YORK (TheStreet) -- The question of whether the Fed will increase interest rates or not continues to worry consumers, businesses and markets across the world. The IMF warned the world's biggest economies that it might be too early to raise interest rates, as risks to global growth persist. But on September 16 and 17, policymakers at Federal Open Market Committee may decide to boost short-term interest rates -- and if that happens, even a minute change can get mixed reactions. With that in mind, here is the good news, bad news and just plain ugly news that would come out of an interest rate hike. If interest rates are increased, borrowers with variable interest rates will be adversely affected. Housing loans will get expensive for borrowers and interest payments on credit cards will also increase. Borrowers seeking student loans will feel the negative effect of the interest rate hike but those who already have student loans will remain unaffected, as the interest rates remains fixed for student loans. Firms that rely heavily on debt could also feel the pressure, due to an increase in borrowing costs. Since 2007, savers could not earn much on their deposits with the banks. With an interest hike, banks will pay more to customers and this is good news for retirees who earn a substantial portion of their income from interest on their savings. An interest rate rise will also make foreign goods more affordable. However, the downside of a strong dollarcan have adverse effects in the long run as American goods become more expensive and may in turn affect trade. As emerging markets struggle amidst market panics, an increase in the Fed funds rate could be damaging for developing economies. Trade, currency and employment levels of developing nations may in turn get affected, as money flows towards the U.S. The World Bank's Chief Economist Kaushik Basu even cautioned that any hike in interest rates could lead to "panic and turmoil" in emerging markets and that the Fed should wait until the global economy stabilizes. According to Daniel Tenegauzer, head of emerging market and global foreign-exchange strategy at Royal Bank of Canada's (RY RBC Capital Markets, "The Fed hikes, the dollar appreciates." The stronger dollar will encourage global investors to invest in the U.S. than in emerging markets. If a strong dollar persists for long, then dollar-denominated debts owed by emerging markets may get severely impacted. Brazil, Turkey, Indonesia, Russia and South Africa may face tough economic conditions in the second half of 2015 due to high borrowing costs. BIS had warned in June that "massive borrowing" by emerging markets have left the countries vulnerable to funding reversals. Due to a strong dollar, developing countries may force the emerging markets to slow down even further, impacting their economic strength, as they will find it harder to repay their dollar-denominated debts. David Hauner, managing director of Bank of America's (BAC Bank of America Merrill Lynch said in The Financial Times that the emerging countries like Brazil, Russia and South Africa could be "worst off" as they are commodity exporters and will "get caught between the strong dollar and a weak China." The Fed funds rate has an indirect effect on mortgage rates as they are long term and driven by supply and demand in the mortgage market. The housing market is largely dependent on mortgage lending and as borrowing costs become expensive; the affordability for buying houses is also influenced. Once the demand to buy houses fall, other industries tied to the housing markets like manufacturing of appliances, flooring, plumbing etc. will also get adversely affected. Interest rate is just one of the market factors that drive long-term mortgage rates, however, according to Lawrence Yun in Forbes. The other factors include inflation rates, global currency reserve status, corporate borrowing enthusiasm, and others. Mortgage rates have fluctuated even when the interest rates have remained stagnant. 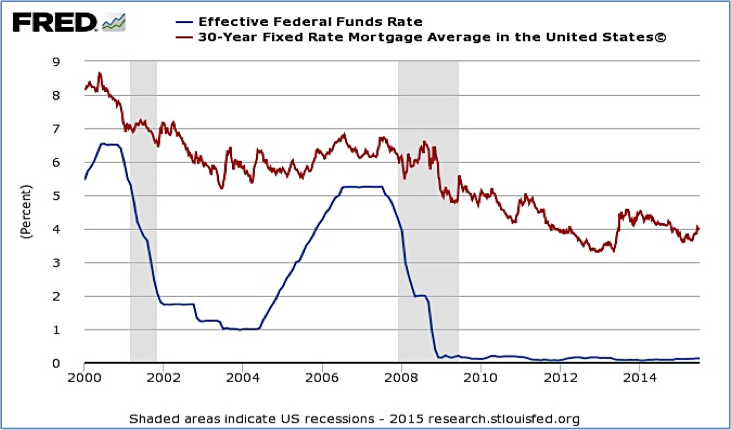 Hence, the overall individual effect of Fed funds rate on long-term mortgage rates could be marginal. A classic example of a marginal difference in mortgage rates during a Fed interest rate change happened during 2004-to-2006. Around this time, the effective Fed funds rate rose to 5.24% (July) from 1% (January). During this two-year period, the 30-year fixed mortgage rate, which is consumers' dominant choice for home financing, ranged between 6.34% and 6.80%. This means that more than four-percentage point rate hike by the Fed resulted in around half a percentage point rise in mortgage rates. In contrast, when the Fed funds rate decreased to 0.16% in December 2008 from 5.26% in July 2007, mortgage rates hovered around 6.73% and 5.53%. A decrease of five points in the Fed funds coincided with a one point drop in mortgage rates. Any rate hike will increase volatility in the stock markets and could make stocks look less attractive, according to CNN Money. But, stock market reaction to interest rate may vary according to different sectors. A study conducted in 2008 by Kunaey Garg determined that few sectors' stock prices with large proportion of debt respond more significantly to changes in Fed funds rate than others. Last time the Fed raised interest rates, on June 26, 2006, the stock markets reacted positively. USA Today reported that Dow Jones had gained 2%; but the markets were 4900 points lower at that time (2006) than they are now, and the 17 th hike had lifted the rate to 5.25%. In comparison to 2006, the current market picture is quite different as the Fed funds rate has been close to 0%-to-0.25% since December 2008 and there has been no increase in interest rate since June 2006. However, with so much speculation about interest rates, it is quite possible that the stock markets may react in case of an "interest rate hike" and "no change," although such reactions could be short lived. But, if investors indulge in emotional investing rather than technical investing, the overreaction to markets may continue to translate into high volatility. Why it's so hard for the Fed to raise interest rates. The good, bad and ugly outcomes on higher interest rates. Everything you wanted to know about the coming Fed rate increase. Why the Fed should be raising rates now. What happens when the Fed raises interest rates.